A stretch of floodplain in northwestern Oklahoma, already known for its profusion of prehistoric hunting sites, has turned up new find: a scatter of butchered bison bones dating back nearly 11,500 years — extending the evidence of bison hunting in the area by centuries, archaeologists say. The find includes nearly three dozen pieces of leg, foot, and back bones from ancient bison, and two stone tools: a quartzite hammerstone and a small, sharp flake fashioned from Texas chert. Together, these artifacts lend new depth to the already ample record of ancient hunts — including three bison-kill sites that are even older — in a region of the southern Plains known as the Beaver River complex. “The Beaver River complex is unique, because it is revisited numerous times during the Paleoindian period, and so much has been preserved for our research,” said Dr. Kristen Carlson, a University of Oklahoma archaeologist. 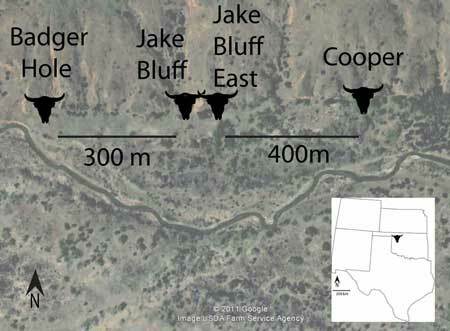 The latest find was made on a narrow bench of land between two arroyos by Carlson’s colleague, Dr. Leland Bement, while surveying previously discovered bison-kill sites nearby. The three other sites in the complex are all found within a range of just 700 meters along the Beaver River, Bement noted, and the oldest of them is more than 12,000 years old, dating to the era of the widespread Clovis culture. The newly found bone-scatter is “the most recent Paleoindian site along this stretch of the river,” he said. The sites discovered here are noteworthy for the hunting technique that they reveal: the use of so-called “arroyo traps,” which the archaeologists say is the oldest known method of large-scale bison hunting. Ancient hunters used arroyos or ditches as natural drive lines, Bement explained, to chase bison and trap them in a dead-end gulch. “When the animals reach the high bank at the dead end of the gully, they can’t get out, and that is when the hunters positioned on the gully rim spear them,” he said. “The animals are then butchered where they fall in the gully. Although the newly found scattering of bones doesn’t include any evidence of the kill itself, their fragmentation, along with the presence of stone tools, indicate that they were processed by prehistoric hunters, Carlson said. “Since the material is isolated, the kill associated with it has likely washed away, a common fate of arroyo trap materials,” Carlson said. “The presence of this small remnant does extend the use period of the Beaver River complex to at least 10,000 [radiocarbon] years ago,” she added. With artifacts in short supply, it’s difficult to know what culture of ancient Plains hunters left these remains behind, Carlson noted. 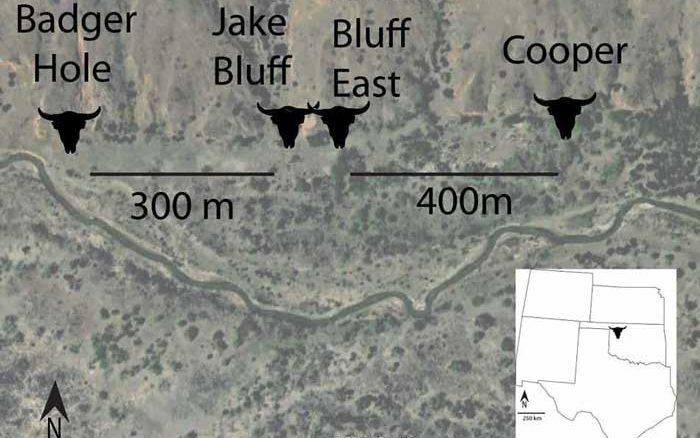 But the three other bison-kill sites in the complex have already revealed signs of a crucial transformation, as the tools used to hunt and process quarry changed noticeably over time: from those of the Clovis culture to its subsequent phase, known as Folsom. 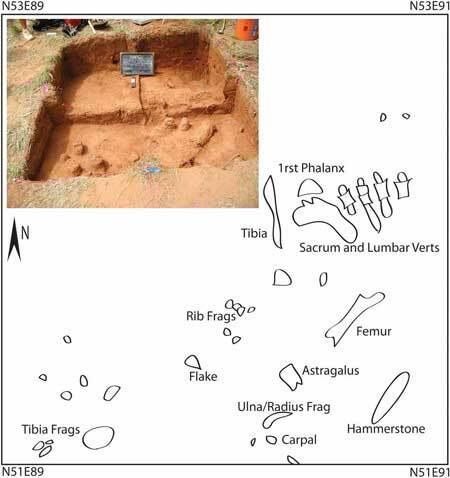 This rich layering of artifacts not only unveils the transition of Southern Plains cultures from one kind of tool kit to the next, Carlson said, it also shows that many generations of hunters visited this specific stretch of land along the Beaver River for at least eight centuries. “To have a kill complex in use for over 800 years speaks to the ability of hunters to plan and coordinate and revisit a successful hunting ground through generations,” Carlson said. “It is far less likely that these people accidentally stumbled across this ideal hunting territory over and over again in the course of 800 years. Carlson and Bement report their findings in the journal PaleoAmerica.